It's official, I have submitted my dissertation which means I am finished with university, after 3 and a half gruelling years of assignments, presentations and reports. I am done with university. Although because of my course length being super weird, I do not officially graduate until the summer. 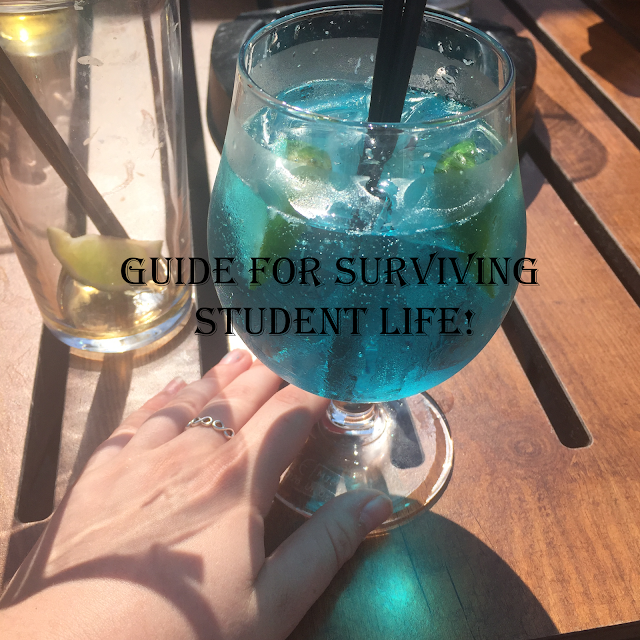 With this is in mind I thought I'd share with you somethings which I've learnt whilst being a student, hopefully those of you who are currently students or going to be in the near future find this post somewhat helpful. Obviously these are just my own opinions and tips on how to make university life that little bit easier. 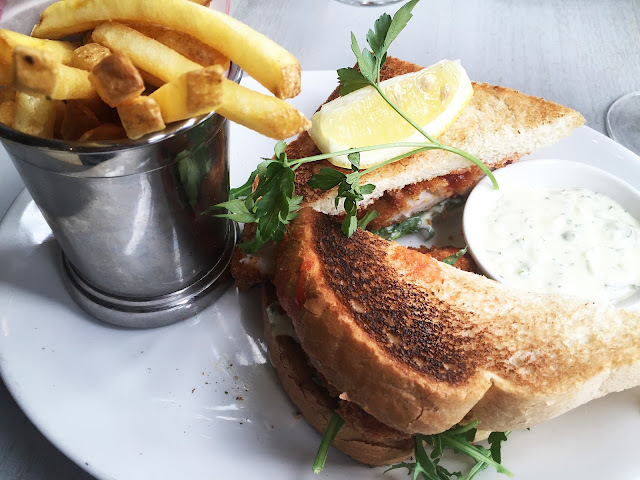 Of course I would start this post with something food related, it's me! I noticed when I first moved into my own place I was spending a lot of money just buying random bits of food from Asda as it was down the road. Or I'd spontaneously buy random bits and never check what I had in to start with. When I started to shop online and the minimum spend was £40 it was a lot easier to keep track of what I was buying as well as plan meals whilst I was doing it. Although I also realised buying fresh stuff didn't really work for me and I would often find it went out of date, freezer stuff like vegetables, pizzas and then cupboard stuff like soup and pasta sauces worked well for me. When you're a university student getting a job is always a plus, being a student is super expensive and there is a reason why students have the broke title because we basically always are. Sometimes even with a part time job, living can get in the way. I remember in my old house massive electric bills would come out at the worst time. When you really need to money for a bill or something urgent and you know you are getting money relatively soon, it is ok to borrow money from places like Quick Loans or Auto Advance. Borrowing money from short term lenders is something that can actually help when you're in a sticky situation. Obviously you have to have some kind of earnings in the first place to be accepted. But having a part time job and being student isn't always enough to cover the bills especially when it is an excepted one and you know it's a few days until your student loans/pay. Check out The Money Advice Service for more info on Payday loans. This is a big one for most university students, and I am one of the worst for doing this, but as great as having a social life is, it is important to get your deadlines done first. I am honestly one of those people who would go out have a good time before my deadlines were handed in and then would spend the next few days in proper panic mode and although my work did well, it was still an extra stress I could of avoided by taking more time to focus on my work in the first place! Honestly being a student has put me off ever living with my friends again, living with my housemates last year there was 5 of us, in a house not big enough for 3 of us. We got on each others nerves like no tomorrow even to the point where I don't speak to one of my housemates at all anymore. Although I nearly lost my best friend at the time it has made us stronger than ever before but living in that house made us all a bit crazy. Although it can be done, it is important to remember personal space is key and make sure the house is big enough for all of your needs. Happy hump day all! How are we doing? We are almost a month into the new year, and 2017 seems to be going significantly better than 2016. Lets hope it stays this way. 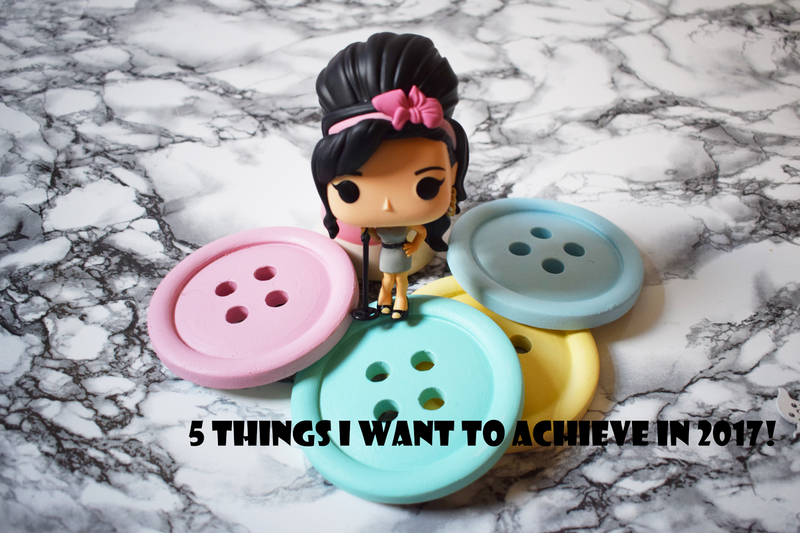 So far this month I've mainly focused on fashion based posts to get me back into blogging. Today I am bringing you a post about what I want to achieve this year, I decided I would share five things I want to achieve and then talk a bit about why. I hope you enjoy this post, I know you lot seem to enjoy my more personal ones so hopefully this is a hit! I am only a matter of a few weeks away from finishing my degree, my course has been a strange length running for three and a half years. I am in my final few weeks and I just need to get my dissertation finished and then I am done. I will officially graduate in the summer and I am super excited to do so. Getting a degree is one of the hardest things I've had to do and I've wanted to drop out so many times, but I am proud of myself for sticking with it. 2. Pass my test and get a car! I started to learn to drive a few years back and I've been learning/doing tests on and off since. I took my last test in September of last year and then for some reason gave up again. This year I will get a license, whether it takes the whole year or just a month, I will do this! Once I finally manage to pass my test I plan on getting car, I've been looking into my options and found that Moneybarn who offer car finance calculator also offer finance to help you purchase a car. It's a great way to get a car and be able to pay back the payments monthly. It's been about four years since I went to my last festival and I enjoyed it so much, I would love to attend another one this year, I got invited to go to Bestival last year but was working *sad times*. I plan on using a lot of my holiday from work this year to be able to go to some festivals over the summer! During my time at university I've been working on the weekends in a call centre for a healthcare company, and I love it so much but I want to get a full time job this year, hopefully get some more stability into my life as well being able to save up to eventually buy my own house. Over the last few years I've worked towards bettering my mental health, and although it's going well considering how bad it was a few years ago, I know I can do more to make myself healthier. I am getting therapy and hopefully by the end of the year I will feel like my old self more. Happy Friday all, I can't believe it's the weekend again already, for the most of you the weekend is the best part of the week but as I work the weekends I prefer the week! I always find it funny when everyone is super excited for the weekend except me and my best mates who work the weekend. For some reason I am really into my fashion posts at the moment, and I don't know why. I am loving making shop my style posts and you guys seem to love them just as much as I enjoy creating them. I don't think of myself as a stylish person but I love making these posts as it shows off my alternative style. I will be creating a Valentines Day themed one in a couple of weeks so keep your eyes pealed for that one. I hope you enjoy this post and as always, let me know your thoughts on the outfits I've created in the comments/on Twitter! Would also pair with black leggings. Hi you lovely lot, how are we? I hope you've had a fabulous week! I am bringing you another post this week and I am rather excited about this one, a while back I created a post about my perfect kitchen and it went down a treat with you guys, so I've decided to bring it back and do a little bit of a series of creating my dream home, starting with the living room and then next I shall be doing the bedroom/bathroom. I thought these type of posts would work best in like a mood board/wishlist styled post. I hope you enjoy this post as much as my last one! Fishpools have the most gorgeous sofas I've ever seen in my life including some gorgeous leather ones and my favourite one which is a fabric sofa called Cadogan! It's a bit out there, but I think it totally sums up my personality in a sofa. I would keep the rest of the room pretty minimal to make the sofa pop. I love this clock because it is simple, yet looks gorgeous. I think it would be perfect in the middle of a wall in the front room with lovely pictures around it, I would love to create a fun feature wall in my front room and this would be start of that. I love the clock in white with the copper rim (bloggers prerogative) although you can get it in other colours such as black and grey. I was recently shopping at The Range, and I fell in love with this beautiful picture, it is so gorgeous and would look amazing on my wall. I would love to get three similar pictures all in black and white looking like they had been had drawn. 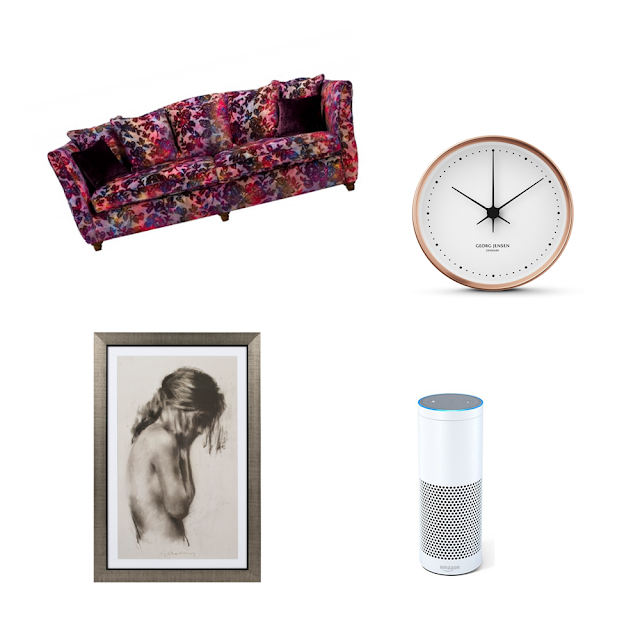 My front room would need some form of speaker for when I have my friends over, I have recently had my eye on the Amazon Echo, and the fact it comes in white makes it even more appealing to me. It's the perfect gadget to have in any front room and the Echo does more than just play music. It also reads audio books and can tell you the news! Win. Hi lovelies, happy Wednesday how are you all doing? I hope you're well. I am so snowed under with my university work and social life, I've been lacking a little bit on the blog posts but I promised you guys I would attempt two a week, and this week I am having this one up today and then one on Friday too! I am excited for it to be Friday as it is my birthday, yay! I will be 22. I plan on playing the Taylor Swift song 22 for the most of the day too. I decided I would create another what I've been loving post as you lot seem to love them. If you missed my first one it is is here for you to catch up on. I'm so in love with this product at the moment, it is improving my acne by like 90% and makes my face feel fresh and clean in the morning. I couldn't imagine kick starting my day without it anymore. I also use it when I am using my Foreo as it gives the skin a deeper clean. Honestly the CUTEST set of mugs I have ever seen, and even better that they stack. Perfect for any kitchen. I love the little faces, they're so adorable! I would love to add these to my quirky kitchen stuff. This is a long time favourite of mine, but I thought it's worth a mention as you are able to now buy it in the UK from Debenhams. It's the best pen liner around and it'll give you the most 'fleeky' liner around. It's easy to use and comes out really black which is amazing. I honestly have not spent as much time in any pair of shoes as I do in my Dr Martens, and it is about time I invested in another pair, I love the colour of these boots and they look like they'd be a gorgeous pair to wear. Mine are a little worn now, as I bought them two years ago, although I will still be wearing my current pair I would love to invest in another pair. 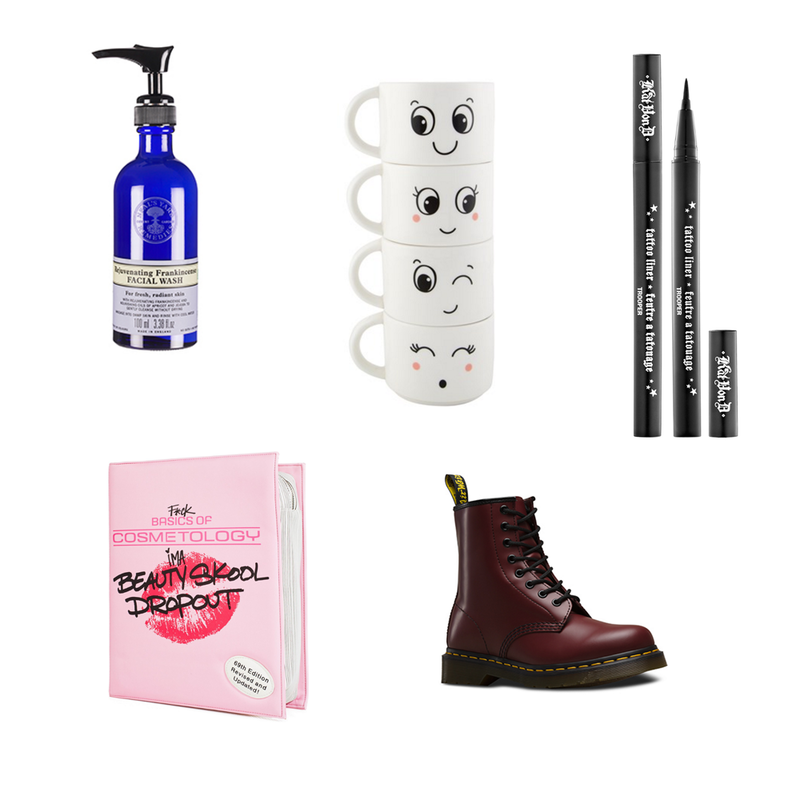 I often share with you that one of my favourite places to shop all things weird and wonderfull is Dollskill, they have the BEST bags by a mile and they're always super quirky and fun. I love this bag because it's a perfect everyday bag. I plan on getting it with my birthday money. Yay! Hi all, how are we doing? Happy Friday. I hope you most of you survived your first week back at work, I didn't get a break from work sadly as I worked all over Christmas and even on Christmas day! But as it's the new year and these posts go down SO well, I am bringing you another shop my style. The last one I did was a Halloween Edition and it is still a super popular post, and for some reason you guys seem to like my weird and quirky style so here we are for round 6. I am thinking of doing a Valentines Day edition of date idea outfits, let me know in the comments if you're interested in seeing this! Look one: Too cool for school! It's me, Olivia. I am back. In case you've forgotten who I am, it's been a while. I lost all of my willpower to blog, I started to hate my photos, my content and I couldn't even face logging in to Twitter. I went through something similar back in 2014 and I gave up blogging for a few months and I didn't want this break to get that bad so I knew as soon as it started to feel like something I 'had' to do instead of what I wanted to do, I took time away and now I feel ready to come back. I apologise to you lot for the content I put out over the last couple of months because it hasn't been my best, but I am going to keep trying to bring you new and fresher content. I plan on having a re-brand over the next few weeks so prepare yourselves for that. It will still be the same Dungarees & Donuts name which you've all gotten to know and love just more of me, I started my blog when I was still in college and I've grown a lot as a person since then. I love to blog about lifestyle and beauty, but I want more for my space on the internet, as you all know I am a huge advocate of mental health and taboo subjects and I want to keep talking about them, I want to keep breaking down the stigma and I will continue to do that. Dungarees & Donuts has always been my space where I can talk about what I want and nobody really has a say about what I can/can't write. I hope when I finally get my plans into motion you all enjoy what I have to offer. For the time being I plan on only putting out one or two posts a week because 3-5 can be seriously soul destroying and they do say less is more. My final request is something along the lines of let me know what you want to see more of on my blog and how I can improve, I want to keep progressing and making my blog the best it can be!